emmatree: okay, she really didn't drive me crazy. she really just made me laugh. okay, she really didn't drive me crazy. she really just made me laugh. 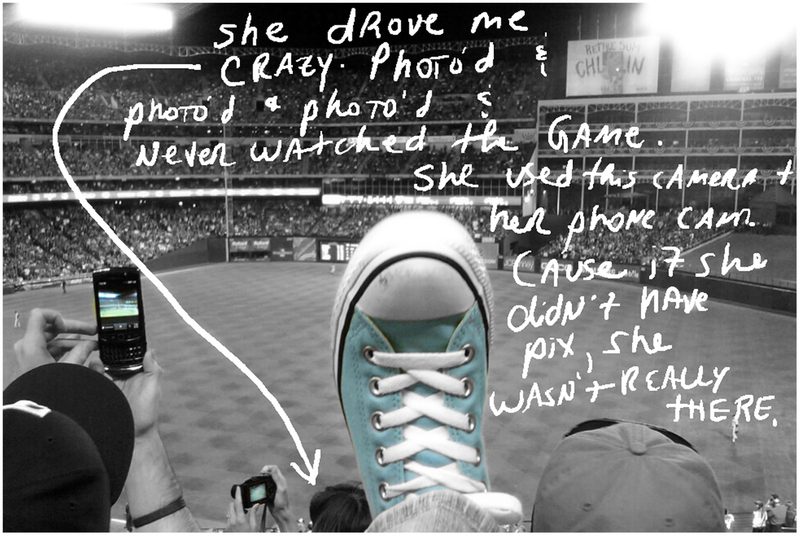 cause it was the world series and there was some energy in the air, folks, and she was missing it, neither of her cameras were catching that energy, that special we've never been here before energy, that if we don't win tonight, it's all over, but still, this is great! energy. she was taking pictures! all the time! everyone was taking pictures some of the time - we have crossed the threshold of the digital age and there is no going back - but this woman was non-stop. i'm not sure she knew the rangers had lost until her husband or whoever he was nudged her and said let's go. it was my first experience with police blocking the hotel parking lot; i'd met elaine earlier - we'd arranged for a bit of time before the game because she lives nearby - and the police told her no, that it would be $20 to park and come inside. we talked them into letting her in for free - i personally think it was her red hair that did the trick - but that's how crazy with energy the whole place was; parking spaces were for sale at the nearby hotels. it was electric. people were lining up, heading into the ballpark as soon as it opened, and when i mentioned this to elaine, she said, well, they didn't want to miss a minute, they wanted to soak up the whole world series experience. and she was right, except for that woman sitting a couple of rows in front of us. the weather was perfect, it was that held-over october weather i spoke of yesterday, a chill in the air later, but not cold. there was a companionship with 50,000 plus people, all of us there speaking the language of baseball. there were those budweiser horses and a dalmation on a firetruck, though i have no idea why; there was a line of spiffed up black denalis, complete with chauffeurs standing alongside, there were rangers tshirts everywhere, red everywhere, cheering, stomping, and when the giants hit a 3 run homerun which would eventually prove to be all they needed to win the game, i was in the ladies' room and every woman in there with me swore. camaraderie. when the game was over and the rangers were off the field, we applauded the giants, and then chanted thank you rangers over and over. it was pretty wonderful. The greatest feeling in the world is to win a major league game. The second-greatest feeling is to lose a major league game. it was pretty great just being there. wow...to be there. in person. pretty damn special ! My heart sings when a team is honoured with enthusiasm, appreciation and respect regardless of the game's outcome. My daughter was a soccer goalie during playoffs last year. She didn't allow a single goal, it was the team's FIRST WIN of the entire season ... she was a hero. They lost the next game. They were completely outmatched, outplayed, outscored. I could see how shattered my daughter was - taking full responsibility for the team's loss and subsequent elimination. And then - her team-mates all ran up the field, screaming her name, hugging her, thanking her, AS IF THEY'D WON. I am so happy you got to experience this! Oooh, you've captured that post-season baseball thing perfectly! I remember in '95 listening to a Mariner-Yankee game on the radio in the car (we'd been at a WSU football game) and my parents and I were so caught up in it that we pulled into this tiny town, found the only restaurant there, went in, and demanded they turn the TV to the game (we couldn't believe they weren't watching it!!). Aaah, such good times. The Mariners won and eventually won that series to go on to the League Championship series, but lost to Cleveland. When they lost I still remember one of the players, Joey Cora, crying in the dugout, and Alex Rodgrigez (then a rookie) comforting him. I was crying, too. this was a wonderful recap..I am so happy I got to "hug your neck" ..
Greetings from San Francisco -- the WINNERS of the 2010 World Series. Hey, I think the Texas Rangers is a great team. I'm even willing to forget that George Bush used to own the Rangers. Better luck next year. Practice makes perfect. Never give up. I attended the homecoming parade for the Giants yesterday in downtown S.F. It was a total mob scene! I was watching, my son kept saying, "geez, you're really into the world series this year"...and i was, it was a great series, tough games, but great baseball. I really like Colby Lewis, so cool and steady. 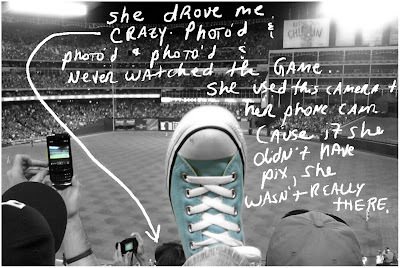 And I felt the same way when we went to see the Red Sox, that companionship. That was my favorite part. Ok, I told you I wasn't that into baseball, and that hockey is more my thing, and only some of the time, but you got to go to the final World Series game? In person, for real?? ?